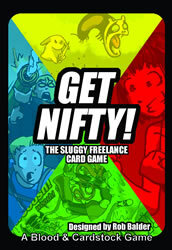 Blood & Cardstock is tickled pink to announce that we will be publishing Get Nifty, the Sluggy Freelance game. This fabulous game is designed by Rob Balder and illustrated by the great Pete Abrams himself! Come play in the Sluggyverse with all your favorite characters.